Most of us toss around the word “friend” as casually as we lob our dirty socks toward the laundry basket. Friends—we think—are buddies, chums, or pals; people we “hang out” and “do stuff” with, or know from work or school. We call, text, and Facebook with their disembodied avatars; we meet them for lunch, accompany them on errands, and invite them over for dinner. We “go to church” with them, attend Bible studies, partake in fellowship meals—even pray, cry, laugh, and perform ministry together. But on what basis can we consider all (or any) of these acquaintances true friends? Surely, there must be more than mutual, interactive enjoyment, the sharing of common interests, or mere situational convenience. By what standard should we call one another “friend”? Proverbs 18:24 partially reveals the character and test of true friendship… although not in the way we might expect. It says, “there is a friend who sticks closer than a brother,” meaning that as close as one can be to his own flesh and blood, true friends are even closer. They will never leave our side, nor turn their backs on us—no matter what. And yet, this is only half the story, because the underlying word here for friend doesn’t mean “buddy” or “pal”—not even “partner” or “companion.” On the contrary, it’s what a “friend” is supposed to be, yet hardly ever is—what we all secretly hope for, yet very rarely find. The word friend, here, is a form of the word a’havah… the Hebrew word for love. So, it is not simply friends who stick closer than a brother, but “loves”—ones who are covenanted together with us, as if our life were their own. Now, what if we can extend this definition of “friend” to what the Master teaches us in John 15:13? He says, “Greater love has no one than this, that anyone may lay down his life for his friends…” his “loves”! * Yeshua willingly laid down His life for us—sacrificed Himself—because we are His friends (His “loves”), but He also commands us to love one another in exactly the same way: “This is my command: that you love one another, as I loved you” (15:12). When we roam through life without being intensely committed and devoted to other people, we are incapable of loving Yeshua (Jn.14:15)! Loving Yeshua is not about Bible studies and worship services—it’s about inconveniencing ourselves and living unselfishly and self-sacrificially toward our “loves” every single day. This is the kind of love that demonstrates Yeshua’s love to the world, because our actions declare that we are His (Jn.13:35). It is a rare thing indeed to walk through life with those faithful few who not only share our standards, values and beliefs, but actually know us at our core (and still want to be with us), are physically there for us in our struggles (not just “I’m praying for you!”), are willing to confront and restore us in our sin, and are quick to sacrifice their own comforts, schedules and resources because they genuinely care for our needs. We wrongly and dangerously believe that these attributes are reserved for God—or worse, the hired clergy we keep on our spiritual and financial payroll. If we ever hope to expand the Reign of God beyond our anemic, isolationist, dysfunctional circles of religiosity and self-serving spirituality, it’s time to get serious about our relationships in the Body. We need to apprehend the basics of love and make commitments not to institutions, organizations and ideologies, but to one another. Only then will we finally begin making real “friends”… and becoming true “loves” of Yeshua. Thank you Kevin for your unselfish hard work. Your work is a blessing and relevant to our times. Thank you for been a true friend and speaking the truth. Thank you for hold my feet to the fire. May Adoni continue to bless you in His work. Excellent exposition of this, Kevin. 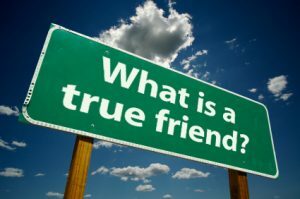 How vital is the meaning of “friend” in Hebrew! And how convicting! You have shined the bright light of His Spirit and His Word on my heart. Thank you. The whole body of Christ needs this convicting word. Kevin, you are dead on. This hits me where it hurts the best. This has been a life long struggle for me. My best friend, has always been a Jewish carpenter. My wife is one of those true to the end friends. Thanx for your insight. To follow Yeshua’s footsteps is the greatest challenge a person can do in all his life’s achievements. one of them is to lay down his life to a friend. Emptying out oneself for the sake of a friend , and to Love a friend , as well as your enemy is sacrificial. It is rare indeed to find a true friend. Out here in Montana, I have found no one who shares with me the biblical meaning of a friend. I have struggled with this for years. I am wondering at this point whether it is acceptable to love from afar, to simply do for others without expecting anything in return, not even acknowledgment. In other words, not get personal. I have tried this at local churches- publishing a cookbook to raise funds, starting a food drive, purchasing and organizing a library worth thousands, and buying instruments for worship, etc. While I don’t expect to be praised for it, I do wonder why it provokes jealousies and accusations of all sorts of things,- basically making others look bad in comparison, which is no where found in my heart. Even so, I accept the criticism for doing good. I don’t mind doing the grunge work of cleaning toilets and taking out the garbage, moving furniture, etc. Folks tend to zoom in and use me for all sorts of things. But I’m told I am “different” and that I make folks afraid.??? I watch myself very carefully and try at all times to remain gentle and humble. What’s the deal here? I have tried so hard to make friends, to have true fellowship in terms of scripture, even if others aren’t on the same page. Is it me, or has individualism and isolationism got such a hold on people’s lives that it’s nearly impossible to make a friend? Sukot – Feast of Temporary Dwellings Would You Still Praise Him, If…?